Nolan Byrd single-handedly saved his school from the bullydom of Alvin "Bubba" Bixby. He posted proof of Bubba's exploits on the Web at Shredderman.com. Now Shredderman is the school hero! But since Shredderman's identity is a secret, everyone still treats Nolan like . . . a nerd. But inside this nerd beats a superhero's heart-one dedicated to truth and justice. So when a vandal spray-paints graffiti around town-and even on his teacher's van!-Nolan decides that tracking down the tagger is a job for Shredderman. 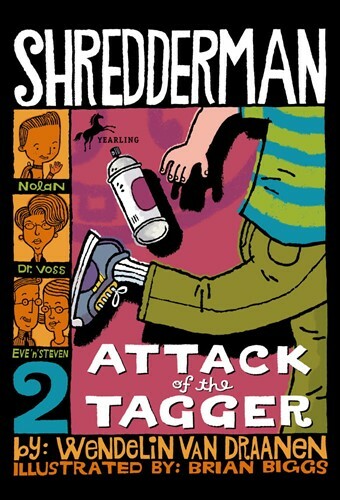 But while he's trying to trap the tagger, the tagger is trying to pin the blame on Shredderman! Can Nolan turn the tables back around before his secret identity is revealed?